In a previous post I told the story of visiting artist Kayum Ma’ax Garcia in his home in the Lacandón Maya village of Nahá during our January 2015 Maya program. During that visit the online Allies Gallery was born. The entire journey was pure magic. The gallery was just one instance of something that evolved organically. As a result, Kayum is able to offer his art to a wider world and has sold some prints. I’m very happy about that, and Kayum and family are ecstatic. Recently Kayum’s work was featured in Galería MUY located in San Cristóbal de Las Casas. The MUY, now part of our Kinship Circle, gives exposure to contemporary art of Indigenous artists of Chiapas. With their help, we’ve been able to bring more of Kayum’s artwork to you. Title: The Heart of the World. Acrylic on canvas. ©2015 Kayum Ma’ax Garcia. To view more, go directly to the Allies Gallery. Kayum rarely leaves his isolated rainforest village. His art is unique. By purchasing through our online gallery, proceeds support this Indigenous artist document a way of life that is increasingly lost. In January I took a group to Nahá as usual during my Maya spiritual travel program. Nahá is a tiny Lacandón Maya village deep in the Lacandón Biosphere of Chiapas, Southern Mexico. We go there to be with Don Antonio Martinez for ceremony and show our respect that he’s still holding traditions when there’s so much pressure for him to let them go. We also visit with the widows of the late spiritual leader Chan K’in Viejo, as well as spending time at sacred Lacandón sites. This time we stopped by Kayum’s home. I hadn’t seen him in years. 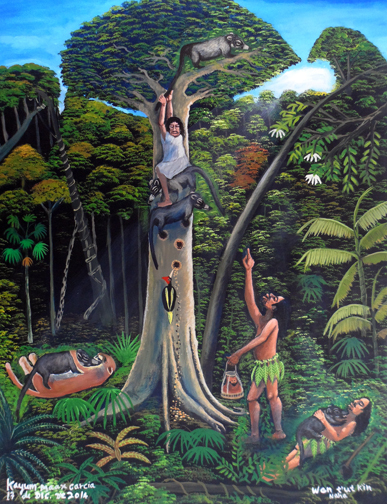 Kayum Ma’ax Garcia is a Lacandón Maya artist of the monkey onen, or clan. He’s also one of Chan K’in Viejo’s sons. He works in acrylics on canvas. In his artwork Kayum conveys actual events, lifeways, creation stories and rituals of a culture nearly gone—as well as his dreams, an important aspect of traditional life. So, in his own way, Kayum is preserving the traditions of his people. I’ve always been fascinated by his art. Traveler Frostie Torres purchases a painting from Kayum during our 2007 program. Photo: Alonso Mendez. But he has little exposure to the world outside his village. I thought to myself, it’s important for his work to get out there, not only to help sustain his family but for others to appreciate Lacandón lifeways and traditions. I suggested to him that he offer his work as archival prints through an online service as I do. But he has no camera, computer or technical knowledge even if he did. Aside from that there’s only Internet at the little lodge where we stay. And the connection is so poor it may as well be non-existent. He had no one to support this possibility, and it was something he really wanted to do after I explained it. The Allies Gallery is now a program supported by Kenosis Spirit Keepers to sponsor Indigenous artists who have extremely limited capabilities to offer their work. Kayum is our first artist. Proceeds of any of his art sales go directly to him. The same will be true for any other artist we include. Our online gallery is now up! You’re invited to check it out and support Kayum through purchase of his work and sharing Allies Gallery with others. We currently have prints available for four of his pieces, in various sizes and formats, and will add more as time goes on. Kenosis Spirit Keepers is the volunteer-run, grassroots organization I founded in 2007 to help preserve Indigenous traditions, a 501(c)3 nonprofit extension of Kenosis. 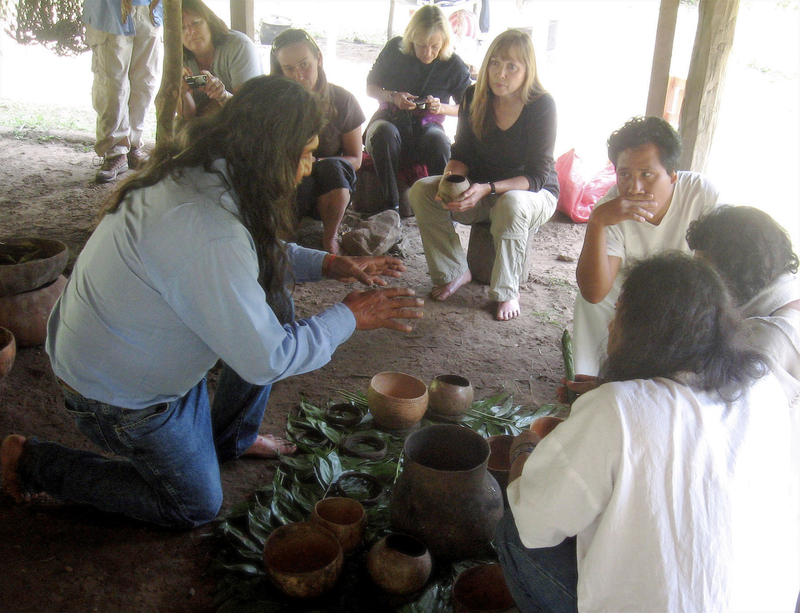 In 2009 an important tradition began, first started by Hopi elder Harold Joseph who accepted an invitation to accompany me on my spiritual travel program Entering the Maya Mysteries. As his religious leader’s emissary, the purpose was to reconnect with relations, those from Hopi migration paths. When I make these invitations on behalf of Kenosis Spirit Keepers, it’s without expectation of outcome. I’ve come to know that as long as we within the circle hold the container sacred…what fills it is rich, often with significance I never could have predicted. The effect Harold had on Don Antonio Martinez, the last Lacandón Maya elder maintaining his timeless traditions, during a very vulnerable time is well documented in my article The Last Spirit Keeper available for download here. Equally significant are the indications Harold saw during our travels through Mayalands that validated his people’s oral history and common thread with these relations of the south. At certain sites he made offerings and prayers. Over these years several other Hopi Spirit Keepers have replicated what Harold started. Mike Weddle is a member of the Kenosis Spirit Keepers’ board who, for more than twenty years, has immersed himself in the sacred ways of the Maya of Guatemala. In his essay Are the Maya and the Hopi Two Branches of the Same Ancestral Tree, he compiled examples of common practices linking the two. He also talked about the protectiveness that Hopi people have over their sacred traditions—in order to preserve them. The intent I hold for spiritual travel has remained the same from the start. It is not to co-opt Indigenous traditions. It is to offer respect through our presence and to hold space that these sacred ways continue. Merle stated the need so well. If in the process we visitors are deeply touched—and we are—we bring this difference home. Who we are in the world is influenced…and felt by our families, friends and communities. Core spiritual elements are strengthened. The anniversary of an important date is coming up for me. In late Spring 2008 I held my breath as I opened an envelope from the IRS…and exhaled with great relief to see that Kenosis Spirit Keepers was given status as a charitable organization, our nonprofit extension. It was signed and dated October 15, 2007. In this post about the continuity of traditions, I also want to express much appreciation to those who have made donations over the years, and certainly to those who have traveled with me…holding reverence, making the circles and sponsorships possible. Through your spiritual integrity, this work continues. Last but certainly not least, the folks who have served on the board since the inception of Kenosis Spirit Keepers, worked hard and assisted with direction and decisions…I have gratitude. 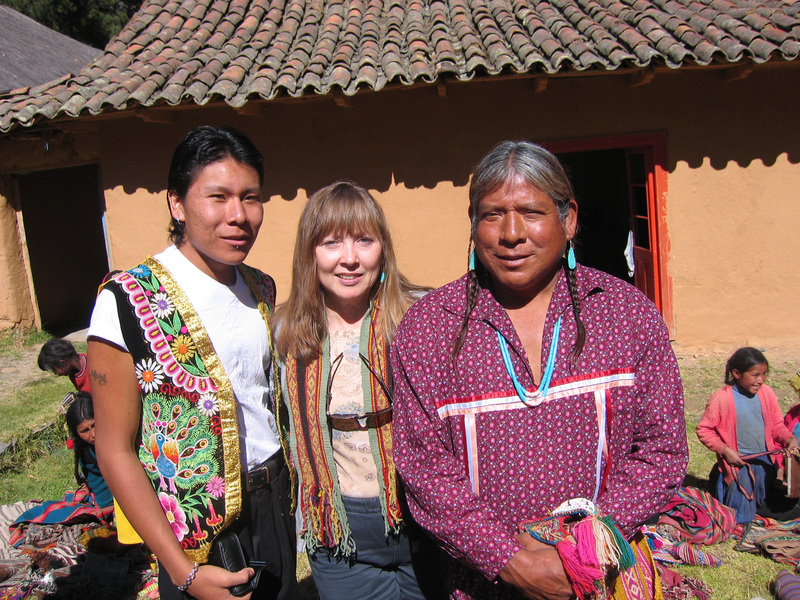 If you are drawn to support connections between the Hopi and Maya peoples, join us January 18-28, 2015 in Chiapas, Mexico for Entering the Maya Mysteries. A portion of tuition is tax-deductible to support the travel of Hopi Merle Namoki and the humanitarian healing work of Don Sergio Castro in impoverished Maya communities. To read more about the unusual occurrence that inspired the founding of Kenosis Spirit Keepers see The Ninth Evolution of the Spirit Keepers Journey (with video). To learn more about the Maya worldview, listen to an excerpt of my interview with Tat Apab’yan Tew, K’iche Maya Daykeeper, who is part of the Maya spiritual travel program. I’m coming up on the nine-year anniversary of an occurrence so significant that I wanted to share it with you, giving it the special transmission it deserves. In numerology, a secret fascination of mine, the number nine is related to convergence of the three worlds—matter, mind, spirit—holy mission, creation, harmony, rhythm and development. Its meaning is given sanctified space in such religious doctrine as the Kabbalah and Bible, and elevated across a number of cultures: Maya, Egyptian, Greek and more. Nine years ago outside Cusco something unusual happened that continues to unfold all these years later. In July 2006 during my spiritual travel program in Peru, we were gathered with Q’ero spiritual leaders for ceremony at the edge of Huaypo Lake. We had just come to closure, the despacho burning, prayers ascending…when Q’ero friends began murmuring amongst themselves. Some were pointing directly overhead. A condor and eagle were flying together. And in the minutes that followed, an inspiration came to me: the compelling urge to somehow start bringing Native people from the US Southwest for intimate circles with their counterparts south. I say “somehow” because I knew no Native people in my home area at the time. Also understand, at the time, I’d never heard of the Condor and Eagle Prophecy. Long story short: I came home from that journey with a vision. Synchronicities occurred. The next summer I returned to Peru bringing David and Clarence Washington, a Hopi father and son from Shungopavi, Second Mesa, Arizona. More Q’ero Wisdom Keepers gathered with us than ever before until we numbered nearly forty. That journey had incredible affect on us all, especially David and Clarence. Coming home, I endured intense labor pains to establish Kenosis Spirit Keepers as the nonprofit extension of Kenosis. Anyone who has done this knows what hoops the IRS makes you jump through. It isn’t pretty. I couldn’t have done it without the support of our fledgling board, particularly Doug Easterling and Lucinda Brogden who knew the territory. I didn’t. In October 2007 we became a legitimate nonprofit whose mission helps to preserve threatened Indigenous traditions. In 2008 Hopi elder Harold Joseph came as our guest to clear the way for other Hopis to safely follow, returning along their migration paths, in the manner given him by the secret society he belongs to. Quietly, he would move away from the group or stay behind while others went on, just for a few minutes then rejoin us. In a number of those places we traveled through in the Cusco and Puno regions that summer, Harold recognized symbols—in a Pachamama cave, in the way the stones were placed in an Inca wall, something carved and almost hidden, in the eagles flying alongside us—which created validation for him. Harold also paved the way in the highlands and lowlands of Chiapas, Mexico. In 2009 his meeting and offerings to Don Antonio Martinez, Lacandón Maya elder in the tiny rainforest village of Najá, came at a vulnerable time—and made a difference. That story and the effect that followed was published by Sacred Fire Magazine in Fall 2012 and may be downloaded. In October 2014 Harold returns to Peru with us. Once again he is acting as the emissary of his religious leader, Lee Wayne Lomayestewa. But this time it’s to seek prayers from the Q’ero spiritual leaders for the continuation of the traditional Hopi way of life, now very much threatened. Council will be held in the Q’ero village of Ccochamocco. 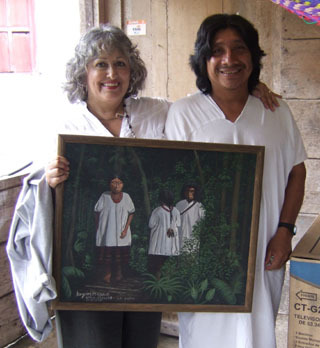 Lorna Joseph from Shungopavi will be joining us in January 2015 for our Maya Mysteries program in Chiapas, Mexico. She has heard the stories from those Tribal members who have traveled with us. Now she wants to experience her southern relations personally and what comes from overlapping creation stories. Such validation creates spiritual strength. The number nine also symbolizes the human gestation period. I never could have predicted all that has occurred since that time I was sitting in circle with Q’ero spiritual leaders in 2006. I had no preconceived notion. Nor do I now. And yet…I sense we are again upon another threshold with this work. I can feel it. And I invite anyone who wants to be part of it, holding intent, to stand beside me with integrity, and take the step. ☀ Individuals from different cultures share a meal and discover camaraderie, even though they don’t understand each other’s spoken language. ☀ Two Indigenous people, with common ancestors, put their heads together and compare notes. ☀ A brown hand is extended to a white hand to offer help up a steep trail. Then the recognition comes: You are my brothers and sisters! *A portion of tuitions for spiritual travel programs are tax-deductible to fund these efforts. Early registration discount for the October 24-November 2, 2014 Heart of the Andes program ends June 20. Early registration discount for the January 18-28, 2015 Entering the Maya Mysteries program ends September 12. ** Thanks so much to Sunny Heartley who composed and produced the soundtrack for this video with his beautiful Native flute music. Visit his website. I am pleased to announce that my latest book has been released and is now available in trade paperback and/or Kindle versions in North America, Europe and the UK. The Kindle version is also available in Japan, Brazil and India. As with all my books, I’m donating 10% of profits from book sales to Kenosis Spirit Keepers, the nonprofit I founded to help preserve Indigenous wisdom traditions—like those featured in the novel. Know that if you’re drawn to read the book, you’re also supporting these important projects. Preston Johns Cadell is tormented. He attempts to outrun discontent and the void in his heart. His mother is hardly around. His father’s origins and disappearance are shrouded by family secrets. His sole remembrance of his father is flying through the stars nestled in his arms. Any comfort Preston derives is from an unseen advisor who teaches him of the invisible world. Now he is coming of age. Memories arrive from long ago when a brown-skinned woman cared for him. But she, too, vanished. Finding the buried remains of his father’s altar, Preston must answer the draw to his destiny, to discover his lineage—even though he has no idea how or where it will lead him. Portals to the Vision Serpent is a Hero’s Journey into the realms of shamanism and the Maya world. Interwoven are the struggles of indigenous peoples to preserve their way of life and tragedies that often come from misunderstandings. Through a family saga of dark wounds and mystery, spiritual healing unfolds. The search to find one’s True Self is a journey that often challenges cultural preconceptions and assumptions. Portals to the Vision Serpent takes this journey deep into the heart of the True People, delivering a story of longing and mystery woven like a story cloth between two worlds. Bloodlines are story lines. In Portals to the Vision Serpent, Carla Woody invites the reader to explore the mysterious, ever-unfolding tale that each one must tell with our lives…one chapter at a time. Step into these pages. Invoke your true name. Re-member who you have always been. Portals to the Vision Serpent is a transcendent spiritual adventure of a soul’s inner and outer journey into the rainforests of Guatemala and Mexico and brings awareness to the struggles of native people amidst the onslaught of cultural genocide. Trade paperback currently available in North America. (Watch for wider distribution soon.) Kindle ebook available in North America, Europe, Japan, India and Brazil. Currently available in trade paperback in North America. Wider distribution coming soon. For several years I have been sponsoring spiritual travel programs to Chiapas Mexico that include time in the rainforest village of Najá. I’ve been quite honored that Don Antonio Martinez, a Lacandón Maya elder, has been willing not only to meet with us, but to hold the balché ceremony while we’re there. 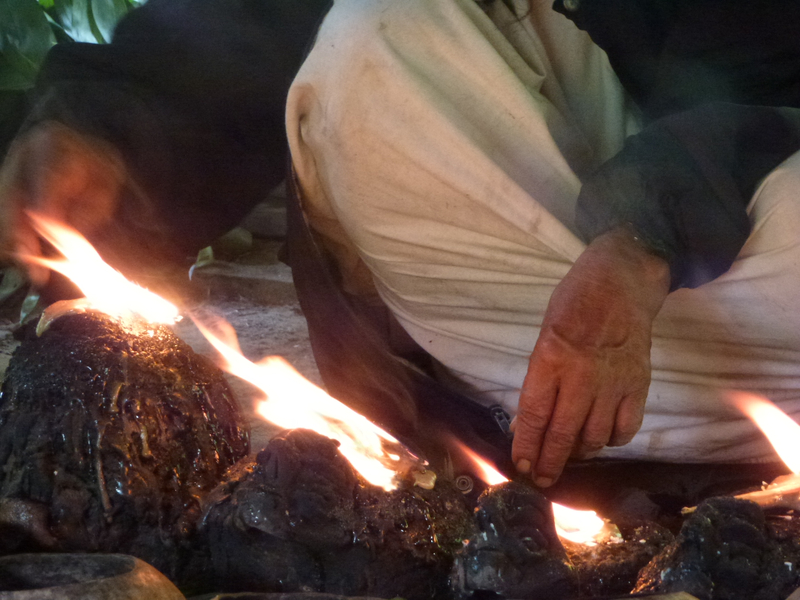 Don Antonio is the last elder still practicing the sacred ways. When he passes it’s likely that these ancient traditions will be gone forever. Over these years I’ve watched the aggressive impact of evangelicals eating away at the Lacandón Maya culture and spiritual traditions, aside from influences from Western culture. and Hopi elder Harold Joseph. Beginning 2009 through Kenosis Spirit Keepers, the nonprofit extension of Kenosis, we’ve been sponsoring Hopi Wisdom Keepers from Shungopavi on these same programs. I’ve written an article highlighting this progressive story of connection between the Hopi and Lacandón Maya and what can happen when relations come together in a beautiful way. Kenosis Spirit Keepers is a friend and affiliate of Sacred Fire Magazine, published by Sacred Fire Foundation. Sacred Fire is the only magazine I know of that shares the stories of ceremony, healing and community that bring us all together so we can thrive in these changing times. Elder tries to keep the godpots burning. …will be featured in the next issue of Sacred Fire, due out in early November. The Magazine would like to gift my readers, colleagues and clients in the US a free copy as a way of introduction. 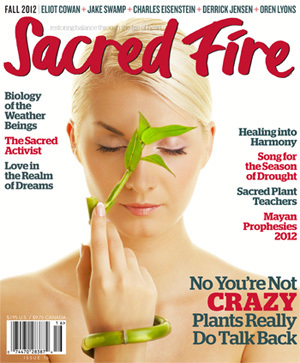 If you would like to know more about Sacred Fire and receive the issue with my article click here. To receive your gift copy—a $10 value—you can enter your shipping information with this link. Please note that you must submit your order by October 31 to receive your gift copy. Sharon Brown, the publisher of Sacred Fire, has asked me to tell you that while the gift offer is for US folks at this time, they are working to make a similar offer to those of you outside the US with payment only for shipping. Stay tuned and I hope to make that announcement soon. Until then…I hope you join me in thanking Sacred Fire for their generosity and important work in service of the planet and global community. so the next thing can come along? The thought of that happening hurts my very soul. I don’t remember what else I said and it probably wasn’t as coherent as I’d have liked just because of the powerful emotions washing over me in that moment. But I do know that I thanked him for his question; I said it was personally quite significant to me. He looked perplexed. Don Antonio Martinez lighting the godpots during the sacred balché ceremony of the Lacandón Maya. Do I understand about cycles, death and rebirth, seasons? Of course. Transition is the nature of the work I do every day. Is it time for these traditions to return to the ether? No! At least, certainly not yet. Through my experiences with Native peoples over the years, I’ve learned these things: They are people who touch the earth, live close to it, who understand the nature of connection of all things…energy…sharing in community…a global consciousness. They hold these threads sacred in their now fragile traditions. If you’re reading this article, then you probably belong to a culture that has largely forgotten these things. And we’re hungry for these aspects that are so rare or fleeting in our present-day societies—especially because the pendulum swing seems stuck toward destruction of these values. Part of my involvement at the conference was to help facilitate a track called “Language of the Soul.” On the final day of that forum, and as a culmination to our activities and discussions, I guided a despacho ceremony—learned from Q’ero spiritual leaders— with those who had chosen that track, about forty people. To my knowledge only one other person there was familiar with the blessing ritual. But all actively participated: folks from such far-flung places like China, Malaysia, Indonesia, Zimbabwe, Australia, United States and others. Afterwards, they made comments about the effect it had on them, such as feeling moved and the sensation of energy for the first time. Hopi elder Harold Joseph (left) sharing traditions in Don Antonio’s godhouse after the balché ceremony. I fully believe that if we honor Indigenous traditions such as those I discussed in Part I…if we’re willing to sit in circle…to take part in these deeply held spiritual rituals…then we touch what’s timeless. We’re injected. A transmission takes place that gets integrated into who we are in the world. And when we hold sacred witness to those who have had the difficult and usually thankless role of holding these filaments—and honor them for the stake they’ve held—a sacred reciprocity occurs. There is a ripple that goes out. When there are enough of us engaged in this way, then perhaps it’s time for some traditions to relinquish themselves. That’s hardly yet though, is it? Isn’t it ironic that this consideration came to me at a conference whose subject matter was global renewal? Maybe it’s easier to create a careful cocoon, to insulate ourselves, to stick our collective heads in the sand and ignore what’s happening around us. I can’t do it. My soul won’t let me. I offer spiritual travel journeys with the premise of supporting Indigenous traditions that are so in danger of decimation through influence from Western culture. Through Kenosis Spirit Keepers, the nonprofit extension of my organization, we sponsor Native Spirit Keepers living in the US so that they may sit in circle and reconnect with Maya, Q’ero and Quechua spiritual leaders and community. Through this intangible process I have witnessed the important effect it has—spiritual beauty and strength. For Western travelers who accompany me, I view our participation and witnessing as a gift of respect, aside from the transformational aspects it has on us. And the long-term effects are forever carried in our souls. For those who are moved to support this work in preservation of Native wisdom traditions and well-being of the Maya people, please join us for Entering the Maya Mysteries, January 13-25, 2013. Your participation matters. Also see my post on the humanitarian work of Don Sergio Castro. Grandmother Flordemayo of the International Council of 13 Indigenous Grandmothers will be with us in January blessing our travels with prayers. Recently I had the good fortune to be invited to participate in a conference on global renewal sponsored by the Bali Institute. 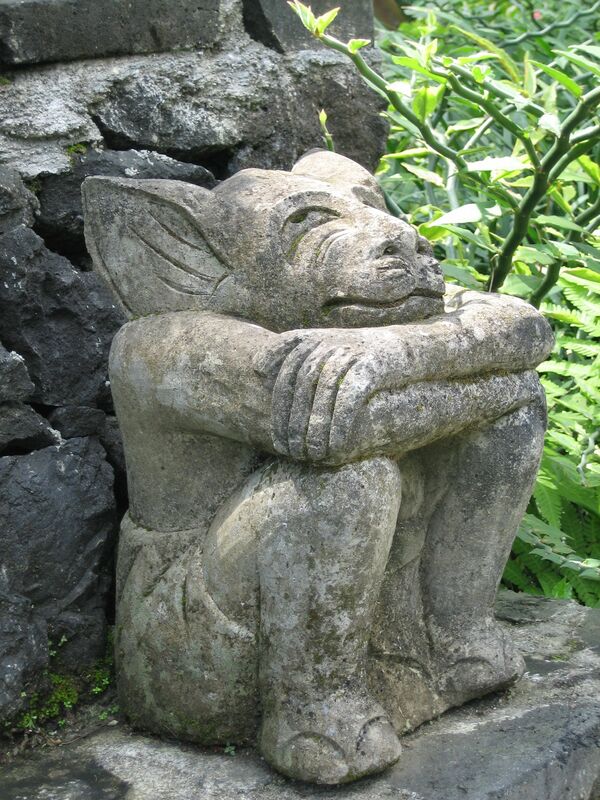 It was held in Ubud, considered to be the cultural and spiritual center of Bali. This was a significant gathering bringing together people from many countries with at least one thing in common — a vision for a better, kinder world and the strong desire to make it happen now. I’m still digesting all that happened for me. Part of it I will share with you here. It was the second day of the conference and I had arrived early to the Bali Classic Centre where it was held. It’s a site too beautiful for words with temples, lush foliage and meandering pathways throughout. I was standing in the open-air pavilion where people tended to gather during breaks, just enjoying my surroundings, when a young man approached me asking if he could speak to me. He indicated he had seen some literature on the programs I’m doing with the Maya in the Chiapas region of Mexico. In particular he was interested in Don Antonio Martinez, the last Spirit Keeper practicing the ancient sacred traditions of the Lacandón Maya. Then he said something I didn’t at all expect. Whether his question came out of earnest interest or a flip attitude didn’t really matter. His words hit me like a shock wave that reverberated in hidden, interior places. This was a question I had come to Bali to hear. Don Antonio Martinez of the Lacandón Maya during the balché ceremony. While I’m fairly sure the effect of the missile wasn’t apparent from the outside, my mind was immediately flooded with images. 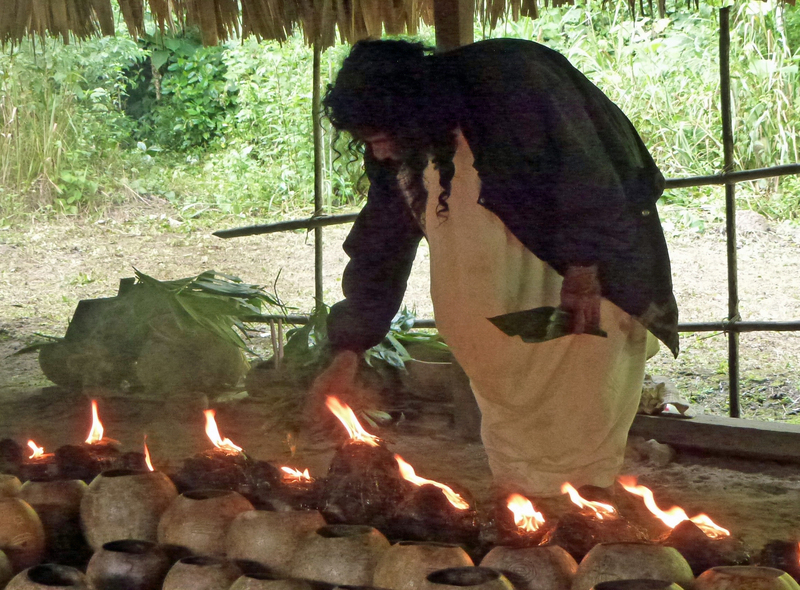 I replayed a time earlier that year with Don Antonio in the middle of the rainforest village of Najá, in his lone god house, burning copal in two of his god pots, chanting, invoking connection with Hachäkyum, the principal deity of the Lacandón, and another god in honor of our visit. He’d chuckled softly when the copal in one of the pots had at first refused to light saying that god was shy that day. Sitting in circle with Q’ero spiritual leaders. 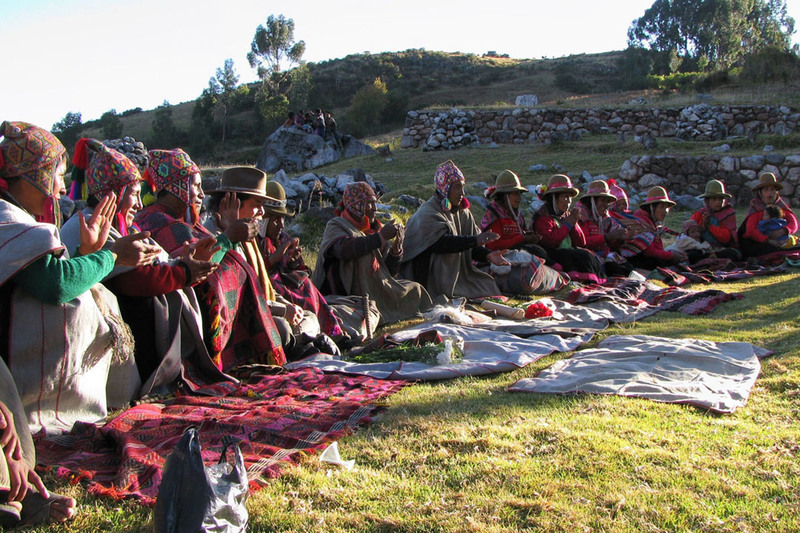 Another image came to me in the next split second, this time in the high mountains of the Andes in Peru, sitting in circle with Q’ero paq’os, or shamans, and other members of the Q’ero Nation, participating in a despacho, or blessing, ceremony. The absolute sense of collectively touching something beyond what is ordinarily presented, my eyes swept the circle of travelers who had come with me; I noted the ceremony’s subtle and sometimes dramatic effect on them. These experiences are precious and will perhaps soon border on extinction just like in the Lacandón rainforest and the myriad other places where the footprint of modern society has been placed. A road is planned to Q’ero, which, until this time, has remained isolated at 17,000 feet in altitude with traditions pure and intact. 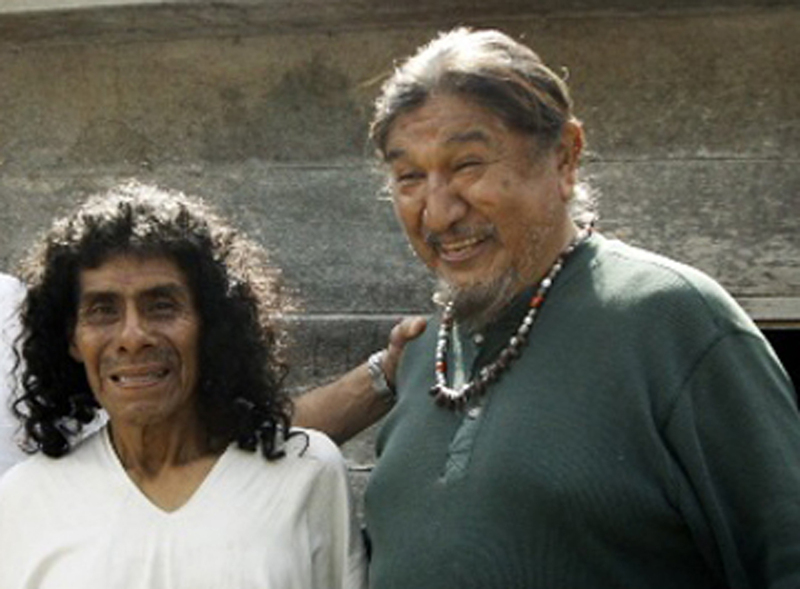 The author with Hopis Clarence Washington (lft) and David Washington (rt) at Salk’awasi, Mollamarka, Peru. Then my mind came to rest on the memory of the Hopi father and son that we sponsored to the Andes that past summer. I recalled the gratitude they expressed frequently, through tears, to be gifted with the opportunity to be in circle with their Quechua brothers and sisters and what it meant to them. As I absorbed the ultimate meaning of the young man’s question coupled with these recollections, I was surprised to find tears welling up from my heart, through my throat, discovering moisture in my eyes. And in a cracking voice, this is what I said to him. *In an area now thoroughly infiltrated by missionaries and decimated by logging companies, Najá was the last hold-out until Chan K’in Viejo, their powerful Spirit Holder, passed in 1997 at about 105 years old. Don Antonio, his son-in-law, is now the last Spirit Keeper maintaining the traditional beliefs and ceremonies. If you are called to support preservation of these fragile traditions—and have a life-transforming experience yourself—I invite you to join us for Entering the Maya Mysteries, January 13-25. Among other opportunities to engage with authentic Maya spiritual leaders, Grandmother Flordemayo, a member of the International Council of 13 Indigenous Grandmothers, will travel with us…lending her prayers to our circles.